What are the Elements of Value for Business-to-Business Decision Makers? How do business buyers make their buying decisions? Is that choice determined by a cost-benefit analysis with rational criteria? Or, since business buyers are humans, do other less rational factors play a role? To answer this question, Bain & Company analyzed three decades of research performed for their clients. They identified 40 distinct elements of value for business-to-business (B2B) buyers. Some elements are clearly rational and relatively easy to quantify, while others are more subjective and harder to measure. 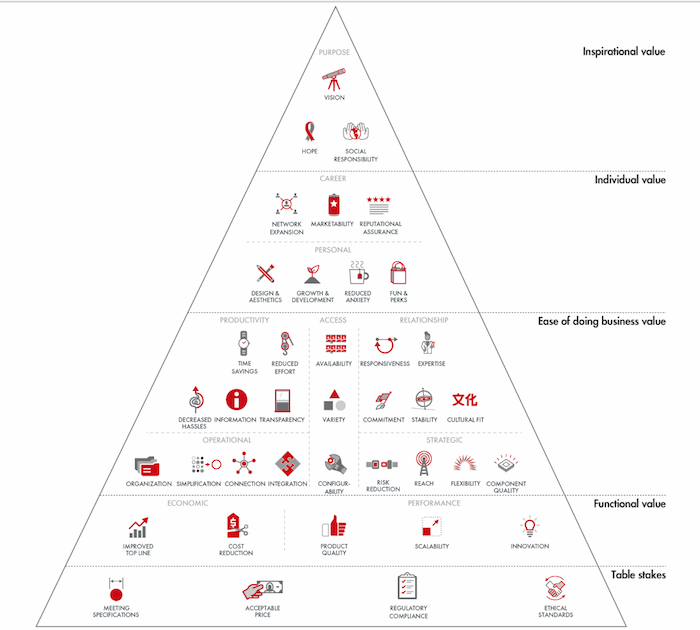 Like Bain’s previous research into elements of value for consumers, which I wrote about here, these elements can be arranged in a pyramid with the less valuable elements forming a base at the bottom and the most valuable elements at the top. Let’s take a look at how some of these elements might apply to an accounting or bookkeeping firm. Level 1: Table stakes. At the base of the pyramid are the most rational elements, which are the prerequisites for being in business. Without these elements, a business will not survive. Performing the work in a competent manner is meeting specifications. Providing these services at an acceptable price with regulatory compliance, while abiding by ethical standards, is the baseline of public expectation for a bookkeeping or accounting firm. Level 2: Functional value. This level begins the possibility of differentiating your firm from commodity service providers. Economic: Business owners are clearly interested in practitioners who can help improve the top line and reduce costs, perhaps by suggesting tax-saving strategies or changes to a business model. Performance: Providing superior customer service is a way to demonstrate excellent product quality. As your clients’ businesses grow, does your business have the resources and capacity to scale and provide additional services? Embracing technology and moving to the cloud demonstrates your firm’s commitment to innovation. Level 3: Ease of doing business. At this level, the opportunity for differentiation increases, as does the subjective nature of the value judgment. Productivity: Providing outsourced bookkeeping services, or helping a business knit together apps with QuickBooks®, helps business owners save time and reduces effort, while decreasing hassle. Providing business owners real-time data gives them the information they need to make better decisions and gives them a transparent view of their operations. 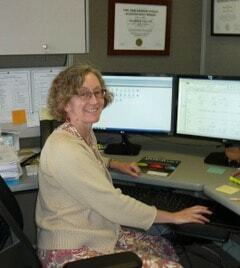 Operational: QuickBooks simplifies accounting for businesses and helps them keep their finances organized. Assisting clients with integrating apps and QuickBooks makes it easier to run their businesses. Relationship: Accounting and bookkeeping are fundamentally relationship businesses, so focusing in on all of these areas enhances your firm’s value. Access: Portals and flexible means of communication enhance availability. Variety of services can make a relationship sticky, but providing too many services may dilute the value if your firm doesn’t have the depth to provide them all. Strategic: No client wants trouble from the IRS or other governmental agencies, so reducing risk is highly valuable. Level 4: Individual. At this level, the focus shifts to what your firm can provide to the business buyer to satisfy their own needs. Personal: A modern, well designed website appeals to your clients’ sense of design and aesthetics. Focusing on your clients’ growth and development – as many of the winners and finalists for the Firm of the Future do – makes your firm a valuable advisor. Removing the burden of payroll compliance from your clients reduces anxiety. Client appreciation events provide fun and perks. Career: In larger businesses, your relationship with your contact as a client – their controller, CFO, VP of finance or even the business owner – may determine whether that client retains your firm. Helping that person achieve their career goals adds value to the relationship. Network expansion helps them meet the mentors and business associates that will help them reach the next level. When your firm is seen as the gold standard in your market, that reputational assurance provides confidence that they have made the right choice. Level 5: Inspirational. At the top of the pyramid are the elements that inspire and encourage. Helping a business owner clarify, expand and work towards their vision gives them hope that their business will endure and leave a powerful legacy. Social responsibility demonstrates that your firm invests in your community to create a better world for all. No firm can excel in all of these elements, and some may be more important to the specific clients you want to work with. By focusing your development as a firm on higher-level elements, you’ll enhance the value of your services to your clients.